These are fascinating and profound subjects and I’m still exploring them, but I wanted to share and collect here some links and information and resources as I go along. The ideas that most fascinate me here are those that concern conscious intention. Can my or your individual conscious intention change the world for the better? Can your and my conscious intention together change the world? What would it take for us–as conscious, aware thinkers focused on peace and eco-harmony–to effect real change–and do we have to be deep meditators or supremely spiritual/psychic/telepathic or otherwise specially endowed in order for our own thoughts and consciousness to make a difference? Could we work together in some way–from just where we are, physically–to stop wars & militarism, stop invasive surveillance and unethical science, stop all the human rights and planetary abuse we are witnessing and living through today? Many scientists working newly in various areas of consciousness seem to concur with long-time meditators on many of these ideas: particularly about moving into a state of focus and coherence through meditation or silence, and then being able to transmit that peaceful intention outward in ways that will ripple energy out from one’s own energetic centers into the world, and actually make a tangible difference in the world we live in today. This film, a documentary by Martin Sereda and James Law, currently on Yutube, Mind Science: We Are All Vibrational Beings, is quite wide-ranging and offers an intriguing collection of new ideas, experiments, and discoveries from many fields, including quantum physics, biology, cardiology, electrophotonics. It brings together as well discoveries from the worlds of yoga and holistic healing, presents the views of many quantum physicists, biologists, psychologists exploring consciousness, energy, and intention, and discusses all sorts of interesting tidbits such as 528Hz, the newfound natural frequency of botanical harmony, and NASA’s audio-enhanced tapes of the sounds that the earth, other planets, and sun in our Solar system make. Some of the ideas offered here include some of the hidden discoveries of quantum physics, that we live in an essentially non-deterministic world, that consciousness collapses the wave function–or, in other words, the nature of our perception defines the nature of our reality. Musicians know this already, and scientists are making discoveries in this area. 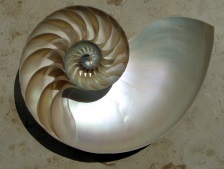 Cymatics, the science of sound waves & shape and form created by sound, like the mathematics of the intriguing Fibonacci spiral, offers visions of pre-existing symmetries in the universe through experiments showing how clusters of tiny particles respond to different frequencies of vibration pulsed through them by assuming different symmetries and patterns. Sound is used for healing today by both traditional shamanistic practitioners worldwide and newer holistic healers exploring its effects. Radio DNA healing is effected in laboratories today using a specific radio frequency, according to Dr. Len Horowitz, and discussed more fully in terms of the science behind it, here at the Sound-focused website Attuned Vibrations. From neuroscience, we know today that brain states and emotions have their own frequencies (in terms of the specific range of electromagnetic radiation/waveforms we give out during each), and that the frequency of relaxed states and meditation, the Theta state, is very low, between 4 to 7.5 Hz or cycles per second or, in deep meditation or deep, dreamless sleep, in the Delta state, even lower, from 0.5 to 4 Hz. This article from The Mind Unleashed covers the basics: Brain Waves and the Deeper States of Consciousness. Also in the film: Using electronphoton imaging through a camera using a methodology called Gas Discharge Visualization (GDV) –similar to the kind of imaging that creates Kirlian photographs of the subtle energies surrounding all living things–Russian physicist Konstantin Koratkov images the layers of energy/aura surrounding the human body, and speaks of how conscious intention can be telepathically communicated from one person to another, something that can be taught to anyone, he says, if both are first attuned vibrationally–empathetically connected–to each other, possibly naturally through relationship. But perhaps also through connection in some common, empathetically-linking cause..? Krishna Madappa, a holistic healer and scientist of consciousness, also uses electronphoton imaging in a study of communication to demonstrate in the film (Mind Science: We Are Vibrational Beings) how, during the process of silent, conscious communication, energy actually can be seen in the process of being transferred from one person’s heart-center to another, across measurable distances. This imaging, like the Kirlian photography, and the cymatic shapes of sound, or the lovely Emoto crystals in water, is absolutely astonishing to see. Deep meditators often speak of the need to first meditate and enter that deep quiet state of calm centering before prayer for any specific outcome, or before any kind of personal decision-making. Now scientists who map energy states offer insights into what happens during these quiet calm states. In their book, the HeartMath founders speak about the calming down and gaining in coherence of all systems–hormonal, nervous, physiological, mental–as the heart’s rhythms settle. Interestingly, this settling can occur in a state of heart-centering, if you make the switch during any kind of stressful moment to heart-emotions like care, compassion, love, harmony, joy–essentially, centering yourself in some way. Taking a moment to do what you love can center you and bring you to a state of internal energetic coherence–it can de-stress, calm, and simultaneously energize and strengthen your total energy potential. William Tiller, a materials scientist, physicist, and founder of The Institute of PsychoEnergetics, which experiments with materials, human intention, and consciousness, talks about the speed of consciousness and all subtle energies in the film (Mind Science: We are Vibrational Beings), as being found to be exponentially faster than light. Consciousness is seen as a super-tiny high-information wave traveling at super-high frequencies, able to penetrate lead/any dense material as it travels almost instantaneously across billions of miles. Also noted is the understanding that holding conscious intention and sending it out via heart energy/emotion while in a coherent energy state arrived at through calming practices or meditation creates visible and measurable effect. One experiment he reports involves changing the pH of water. He reports that he and his researchers were able to change the pH in a container of water by intention alone, after arriving at a meditative state, and further were able to “store” that intention in a way that other containers of water kept beside the first one came to be changed in pH later. From these and other experiments, he theorizes that we are surrounded/immersed/exist in an interpenetrative second kind of reality–apart from the physical one of atoms and molecules we’re familiar with–which exists in the vacuum between the electrical particles within our normal reality, is invisible, is of a magnetic, information-wave nature, and is what can be influenced by our intention! To see more, please read his white paper on Intention-Host Device Research, or watch videos on his website where he talks more about these experiments. His interviews with Lilou Mace and others can be found on Youtube. Dr. Gary Schwartz, a psychologist and researcher of energy healing, also featured in the film (Mind Science: We Are All Vibrational Beings), mentions Lynne McTaggart, a science journalist and writer known for her books The Intention Experiments and The Field, where she interviews several quantum physicists, physicians, and others, and presents evidence for the Zero Point Field connecting all aspects of our reality, the invisible field of consciousness and information within which they say we all live. He speaks about intention experiments where groups of assembled people send intention and energy to plants, and cause plants and leaves to glow brilliantly, as recorded with Kirlian imaging. 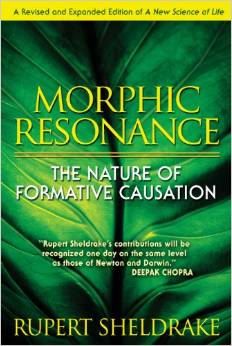 The effects of consciousness building and making natural changes (in the field of what we call Reality) on its own comes here from biologist Rupert Sheldrake‘s theories of Morphic Resonance or what he calls Collective Memory or Changes in the Habits of Nature. He explains this in various talks and writings, including here in this rather wide-ranging conversation with Joe Rogan–right at the opening of their conversation–where he talks about the mice/bluetit experiments. Essentially, biologists have observed that learning seems to be transmitted across generations and across populations of any given species–whether mice, or bluetits (known as chickadees in the US)–in a non-genetic, non-local way. Once the consciousness of something comes into being, it seems to ripple across space and across time without specific agency. This transmission accelerates with repetition, as the morphic field is strengthened. The most important aspect here is the initial nugget of consciousness itself, and how the repeated acquisition of this nugget of consciousness by other members of the species seems to smoothen and make easier the path for succeeding comers. This article by Rupert Sheldrake in Psychological Perspectives, on how all this may relate to human consciousness–Society, Spirit, and Ritual: Morphic Resonance and the Collective Unconscious–is an interesting read, not least in its focus on fascinating aspects of the natural world, from studies of architectural ants to the maneuver waves of birds. Doing what you love or focusing on what or who you love is a way it seems of slipping both into Alpha-consciousness–being in the zone, being at one with your work, and of expanding and resting in your heart-intelligence, with its expansive electromagnetic field. Centering yourself in that way, or by stilling yourself with meditation or just sitting in calm silence, you can then send your conscious intention for peace and eco-harmony out into the world and know that waves are rippling outward, carrying your powerful vibrations, into the invisible, interpenetrative, morphogenetic field that encloses all reality, and builds and unfolds as more of us enter and act from that space of calm center. That would mean our collective thoughts and hopes for a transition to a peaceful, harmonious co-existence, for an ending to wars and militarism, corporate oppression and global totalitarianism, not to mention absolute destruction of the planet, if rising from a centered, calm, and heart-intense place, can indeed make a difference and start rippling changes outward into our common reality. Deep meditators from old traditions and scientists exploring new frontiers are together giving us immense hope: conscious, centered intention practiced by individuals can and will create real change. No leap of the imagination then to say that your peaceful thoughts and calm centered intentions can indeed help shape our collective reality, our present, and our future. The Global Consciousness Project out of Princeton has a lot of resources online, including information on quantum computer experiments using randomized number generators proving that moments of focused global interest–whether on Princess Diana’s death or some other major event–create moments of coherence and order. See this Overview. The HeartMath Institute runs a Global Coherence Initiative online, where they invite everyone to become GCI ambassadors, and tune in together via their Global Care Room at set-up times to focus/meditate and send out peace intentions. Their instructions on how to enter that heart-space of coherence are quite compelling. More on unified fields, coherence, intention, and consciousness soon! I haven’t set up a newsletter yet, debadatta145. Thank you so much for asking, and maybe that’s something to build toward. Meanwhile, please do follow the blog on Facebook or WordPress, as I continue to explore these subjects. Posts under Consciousness will be added regularly every week.